A high-frequency seismic swarm began at the volcano on 4 June, peaking on 10-11 June, and centered along a roughly NE-SW zone 20 km long (figure 1). Of the numerous earthquakes recorded by the regional seismic network (most stations are E or S of the island), 12 were locatable. These events were concentrated at ~8 km depth (1-65 km depth range) and had magnitudes between 2.9 and 4.4 (the largest, at 27 km depth, was recorded at 0148 on 11 June). Several earthquakes were felt by island residents, but there were no reports of damage or injuries. On 13 June, a portable 3-component seismograph was installed on the island, previously uninstrumented, to supplement the regional seismic network, but activity declined, and only two additional events had been located as of 16 June. Figure 1. Epicenter map of 12 earthquakes near Saba, 4-16 June 1992. Courtesy of the Seismic Research Unit, UWI. Information Contacts: L. Lynch, UWI; A. Smith, Univ of Puerto Rico. The Global Volcanism Program has no Weekly Reports available for Saba. Saba, the northernmost active volcano of the West Indies, is a small 5-km-diameter island forming the upper half of a large stratovolcano that rises 1500 m above the sea floor. Its eruptive history is characterized by the emplacement of lava domes and associated pyroclastic flows. The summit of the volcano, known as Mount Scenery (or The Mountain), is a Holocene lava dome that overtops a major collapse scarp that formed about 100,000 years ago. Flank domes were constructed on the SW, SE, east, and NE sides of the island near the coast. A large andesitic lava flow entered the sea on the NE flank, forming the Flat Point Peninsula, the only site level enough on which to locate the island's airport. The village of The Bottom overlies pyroclastic-surge deposits that contain European pottery fragments and were radiocarbon dated at 280 +/- 80 years before present. The village was settled in 1640 on grassy meadows on the volcano's flanks reflecting initial vegetation recovery following destruction of tropical rainforests by pyroclastic flows and surges. Lava dome growth may also have occurred during this SW-flank eruption. Baker P E, Buckley F, Padfield T, 1980. Petrology of the volcanic rocks of Saba, West Indies. Bull Volcanol, 43: 337-346. Lindsay J M, Robertson R E A, Shepherd J B, Ali S (eds), 2005. Volcanic Hazard Atlas of the Lesser Antilles. Trinidad and Tobago, Seismic Res Unit, Univ West Indies, 279 p.
Roobol M J, Smith A L, 1989. Volcanic and associated hazards in the Lesser Antilles. In: Latter J H (ed), Volcanic Hazards - Assessment and Monitoring, Berlin: Springer-Verlag, p 57-85. Roobol M J, Smith A L, 2004. Volcanology of Saba and St. Eustatius, northern Lesser Antilles. Amsterdam: Royal Netherlands Academy of Arts and Letters, 320 p.
Smith A L, Roobol M J, 2005. Saba. In: Lindsay J M, Robertson R E A, Shepherd J B, Ali S (eds). Volcanic Hazard Atlas of the Lesser Antilles, Trinidad and Tobago, Seismic Res Unit, Univ West Indies, p 179-190. There is no Deformation History data available for Saba. There is no Emissions History data available for Saba. Mt. Scenery, the summit lava dome of Saba volcano, is seen from the airport on the NE side of the island. The sun-dappled slopes in the foreground are the surface of a large andesitic lava flow that descends the NE flank of the volcano and forms the Flat Point Peninsula, on which the airport was constructed. A steep switch-backed road extends from the airport to the village of Lower Hells Gate (center). 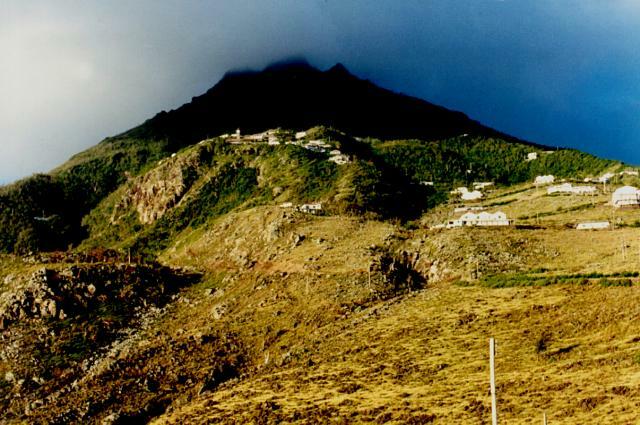 Saba is the northernmost active volcano of the West Indies. Photo by John Shepherd, 2000 (Seismic Research Unit, University of West Indies). The Global Volcanism Program has no maps available for Saba. There are no samples for Saba in the Smithsonian's NMNH Department of Mineral Sciences Rock and Ore collection. Large Eruptions of Saba Information about large Quaternary eruptions (VEI >= 4) is cataloged in the Large Magnitude Explosive Volcanic Eruptions (LaMEVE) database of the Volcano Global Risk Identification and Analysis Project (VOGRIPA).